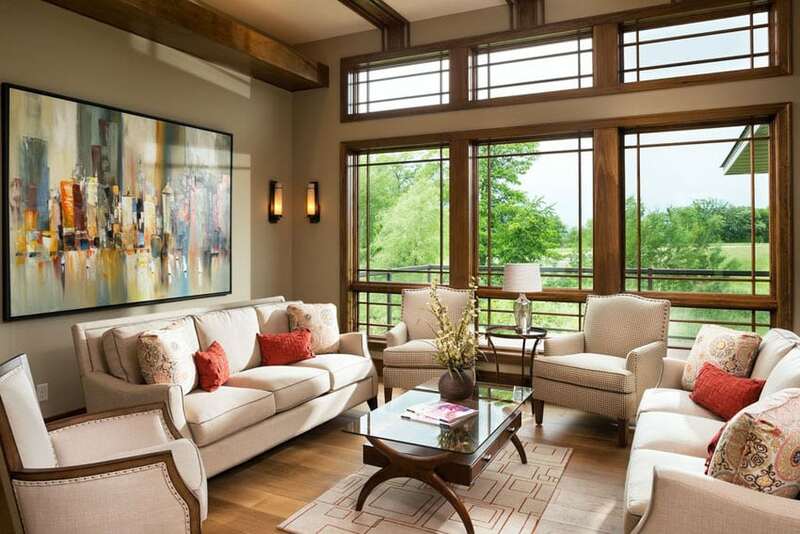 Welcome to our gallery featuring luxury craftsman living rooms. The craftsman living room style is known for its handcrafted custom design elements, high ceilings with exposed beams, open layout and the warmth of its natural wood finishes. Entering one of these spaces one can feel the attention to detail and custom details that provide a warm and inviting ambiance. The gorgeous formal living room in the picture above offers a combination of a generous floor space, balance and a high ceiling. Modern aesthetics were applied and combined with more classic elements for a gorgeous balance of old and new. 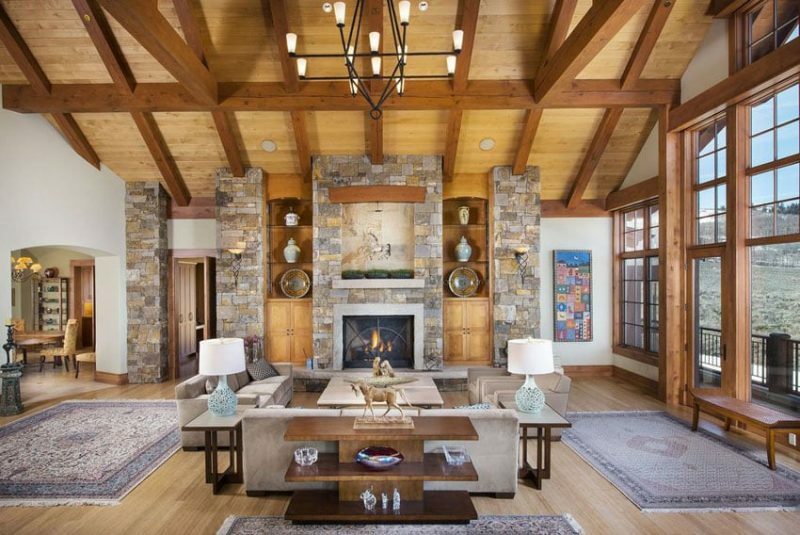 Walls are simply white, while the ceiling is a combination of maple wood planks and solid teak wood beams and trusses. Floors on the other hand, uses a more neutral pale maple solid wood flooring for a softer look. The accent wall uses stone masonry cladding for its columns, with built-in maple wood display shelves. Furniture pieces are all matching, and is composed of two large sofas & two armchairs upholstered in light beige velvet, a console table, coffee table and a pair of side tables. You will also notice that traditional style rugs were strategically placed on open, empty spaces of the floor to make it look occupied. Custom wood finishes – One of the most distinctive attributes of this style is the warmth of its wood finishes and details. From its wood moldings, to door & windows casements the custom wood finishes show an attention to details of the Arts and Crafts style. 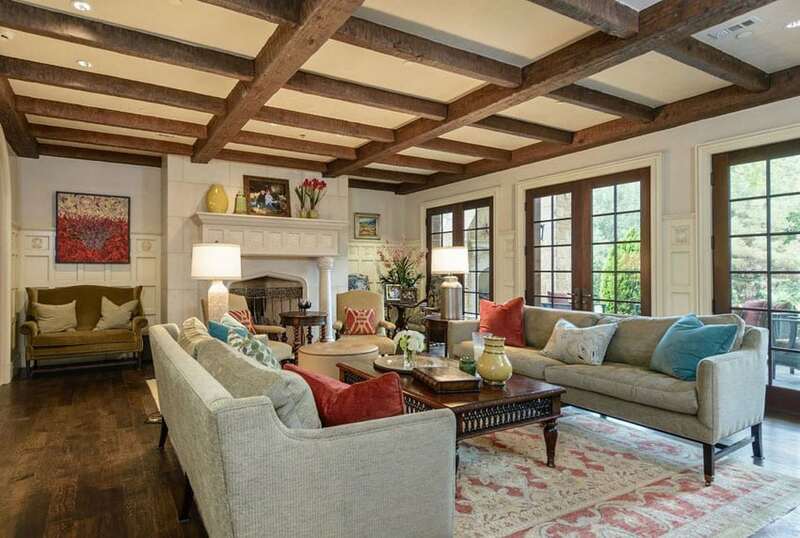 Exposed beams – Dramatic exposed wood beams look impressive and provide an elegance to the space. 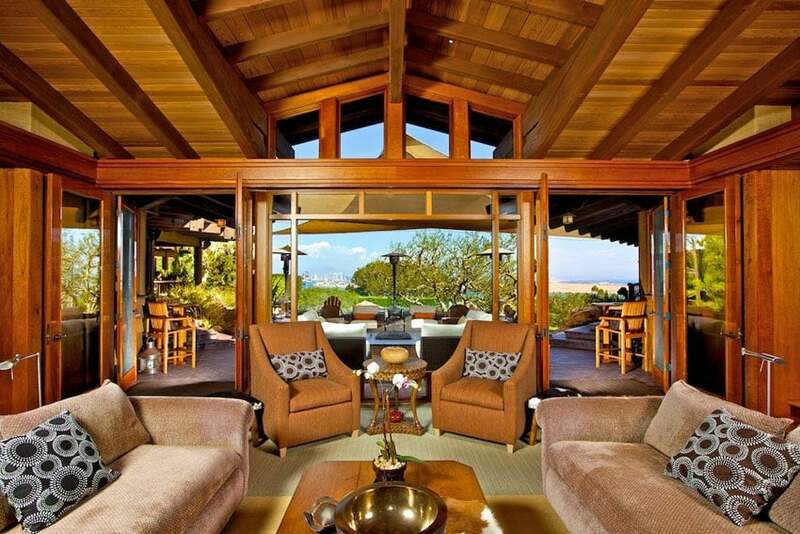 Large windows – The wood finishes of this style rely on plenty of light to brighten the room. Windows can also provide views to the outside and help maintain a connection to the outdoors. Window casings – Windows are framed with detailed wood casings that work in conjunction with door openings, and ceiling treatments to match the overall design. Hardwood flooring – Beautiful hardwood floors flow through the space to help create a connection to the porch, kitchen, dining room and outdoor entertaining area. This living room design has a more relaxed, casual vibe to it focusing on the large openings and the red tones of the solid teak wood used in the structure. Walls, doors and windows are all made or clad with solid teak wood giving it a glossy, orange finish. 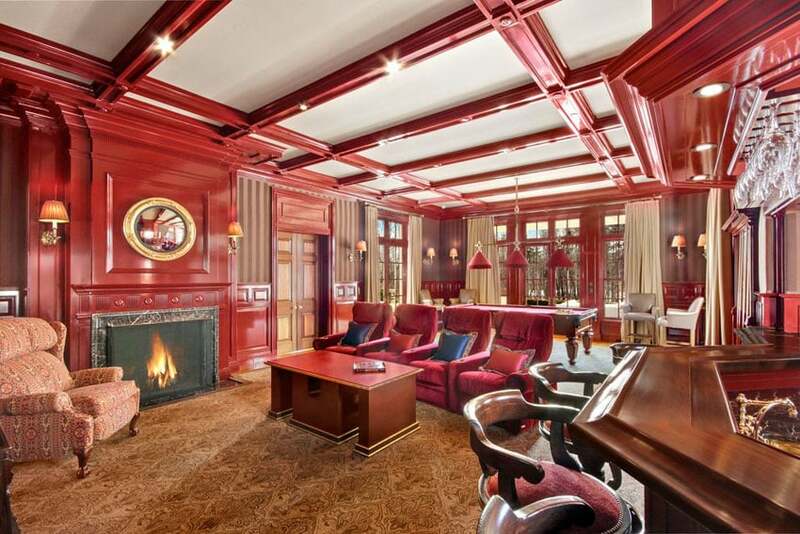 The ceiling, on the other hand, uses a more neutral oak wood finish to help balance out the reds. The furniture pieces matches the over-all color scheme of the structure, using dark orange and brown upholstery for the accent chairs and sofas to match. 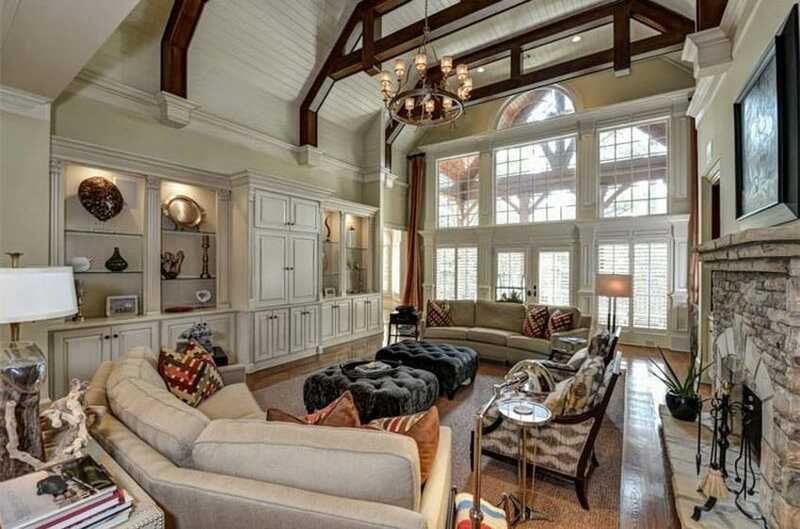 This massive English style craftsman living room not only has a generous floor area, but also a high ceiling, making the space appear brighter and even more spacious. Focusing on natural colors, most of the space uses neutrals with a touch of deep blue for a subtle accent color. The walls and ceiling uses a uniform paint finish, which looks good especially with the solid walnut ceiling trusses. Hanging down the ceiling are wrought iron chandeliers which help set a cozy ambiance to the space, while the furniture pieces demonstrate classic elegance and excellent craftsmanship. This living room has a more relaxed, tropical-Mediterranean feel to it, combining both modern and classic elements to create this look. 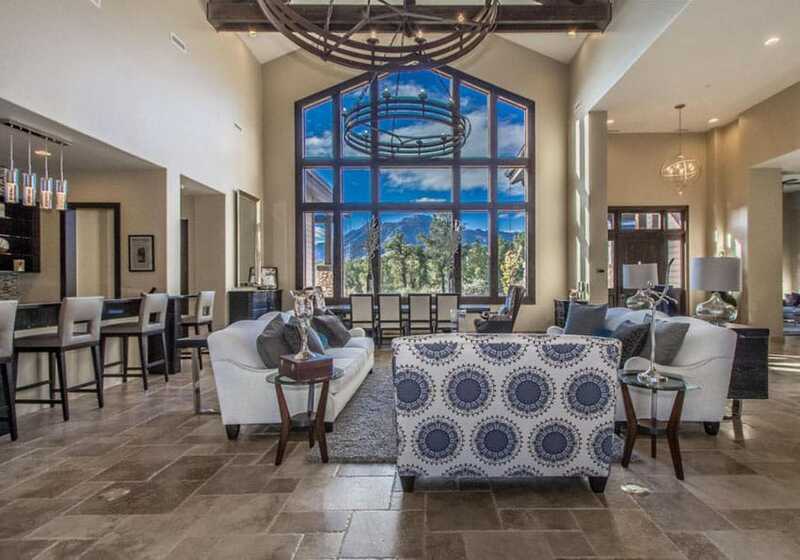 You will see large arched openings characteristic of Mediterranean architecture, hardwood floors and exposed wooden ceiling, creating a very detailed and dynamic backdrop for the living area. The furniture pieces on the other hand are composed of a combination of Spanish furniture pieces and more modern upholstered sofas, creating clean and crisp look, while maintaining the elegant appeal of classic styles. Neutral colors are mixed in with subdued mint greens to create a younger, more refreshing look to this living room design. All wood finishes, including loose furniture, use the same walnut finish, giving it a wall-coordinated appeal. Walls and ceiling are painted in a light cream color, giving a bright yet warm atmosphere to the room, while other furniture pieces uses a combination of light beige fabric and light mint green to add a touch of soft, fresh look to the space. This living room design is a bit bolder and more experimental when it comes to colors and finishes. You will see a variety of patterns used all-throughout the fabrics used in space, combined with a variety of polished wood finishes. The massive display cabinet/shelf is made of polished mahogany, and has a built-in electric fireplace and wall-mounted television. Being placed against plain off-white walls makes it stand out from the rest of the wall, and helps bring your attention to it, due to its massive size. The furniture pieces, on the other hand, is composed of a leather-upholstered camel-back sofa and a floral upholstered sofa, combined with a striped Spanish-style bergere. The yellows and reds found in the furniture fabrics and pillows helps add a touch of vibrancy to the otherwise neutral-colored space. The steep gabled ceiling of this living room space is fairly reminiscent of Gothic style architecture, but only more modern in shape and form. This living room only has the bar necessities, yet it still manages to be stunning, because of the excellent combination of finishes. Solid Mahogany floors are used for the whole space, and is paired with rustic bricks all over the walls, giving it a more aged/rustic feel. Because of the strong red tones and texture of the walls and floors, the furniture pieces used are more low-key, upholstered in light beige linen with elegant scroll arms and a matching traditional rug. The orange and turquoise accent colors used in this living area gives the space a brighter, more youthful vibe, despite the classic craftsman style of interior architecture. Dark oak floors matches the wooden beam finish, while the walls are paneled in white-painted wood with medallion accents, giving it a more neo-classic look. Furniture pieces are mostly Spanish-inspired, with dark hardwood legs and neutral-colored upholstery. 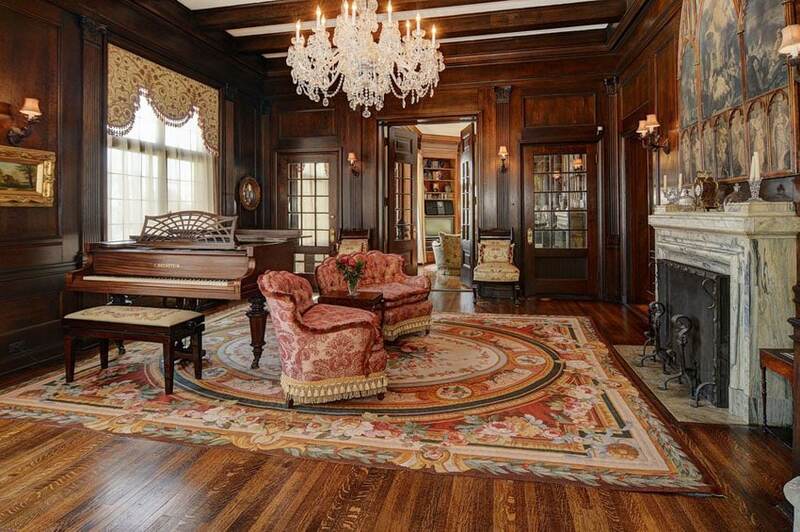 This living room has a very formal feel to it, thanks to its very formal and symmetrical layout. It also goes heavy with textures, using sandstone cladding for all of its walls, and using golden walnut moldings for the ceiling. The sandstone cladding gives the space a warm neutral background, which helps make the four black leather-upholstered armchairs stand out, as well as the wengue-finished wooden furniture pieces. This craftsman living room design goes for a bolder color scheme, using classic floral patterns combined with a variety of materials in red. Perfectly polished redwood is seen used all-over the space – from the accent wall, the doors and windows, wall panelings and even the coffer ceiling and its moldings. The red adds a touch or bold yet warm glow to the space, and is a perfect pair with the brown striped wallpaper. 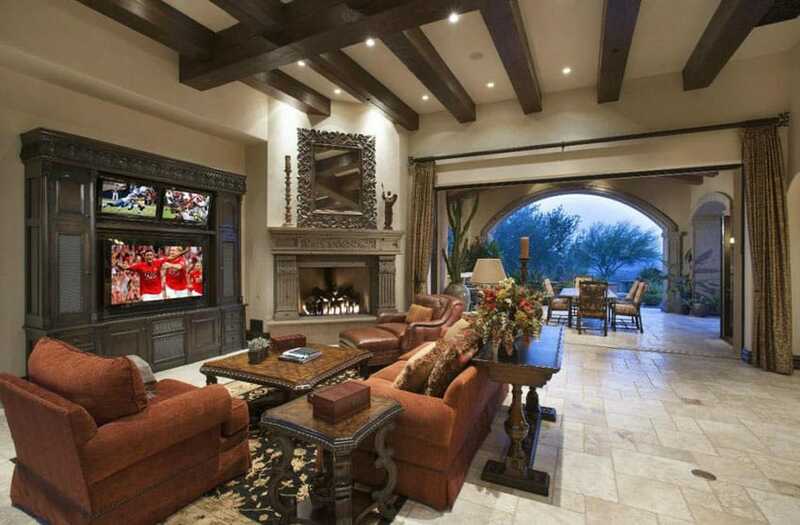 This living area has a more casual feel to it, as it is placed in a pool/game room with a casual bar area. The golden walnut wood finish used all over this space makes this design leave a very elegant impression. Perfectly polished golden walnut is seen all-over the walls, the floors, ceiling, raining and even the built-in cabinetry, giving the space a warm and cozy feel. Because there are lots of wood finishes already, the furniture pieces and even the fireplace mantle, opted to use more neutral colors like off-white and gray to help balance out the warm tones of the wood. The result is a well-balanced design which has a casual yet elegant feel to it. From another angle you can see the full living room layout including both sides of the incredible custom wood and wrought iron wrap around balcony. 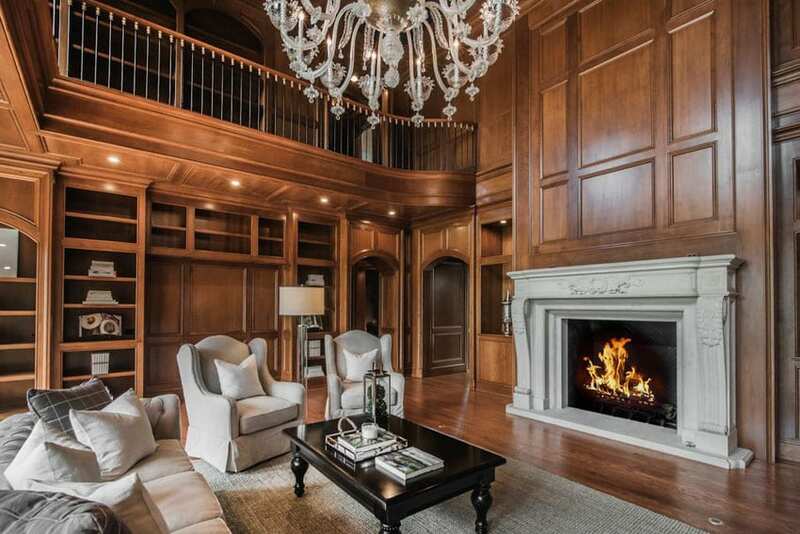 Multiple built-in wood bookshelves, cabinets and large entertainment center give this room a distinguished elegance. 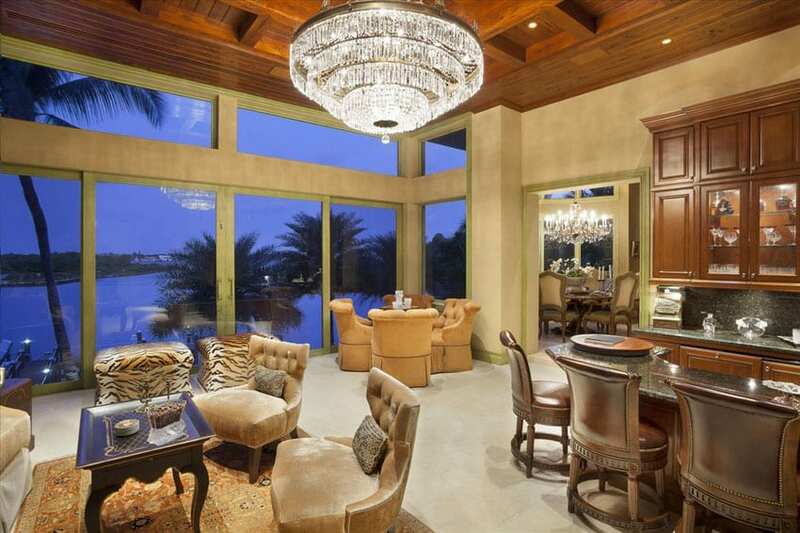 The large crystal chandelier makes a grand statement and really enhances the luxurious feel of this space. 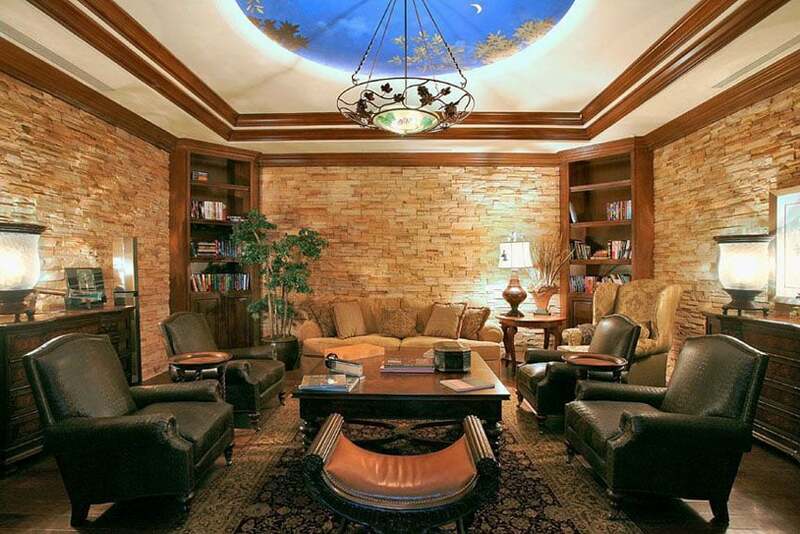 What’s really unique about this living room is its intricate exposed ceiling. 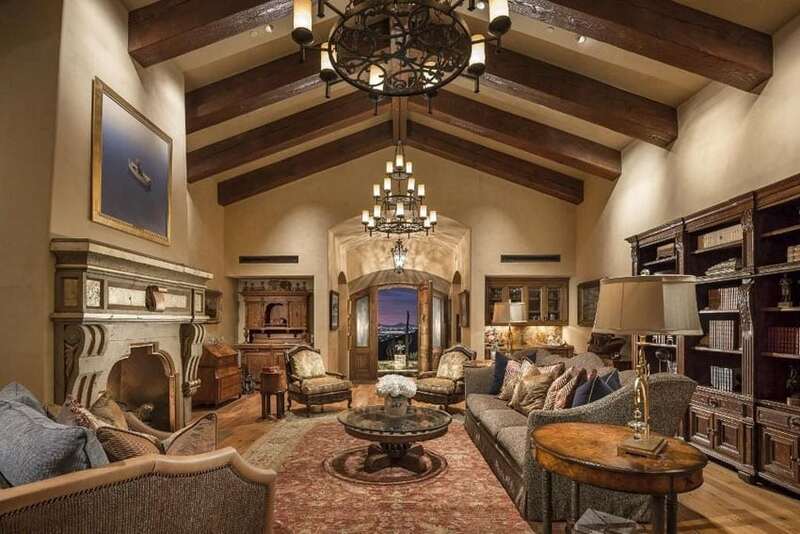 Unlike usual exposed ceilings with plain wood beams this ceiling features intricate lattice work and an interesting shape that is reminiscent of a ski chalet. With wood flooring throughout, a rustic chandelier and wall sconces this room definitely evokes old world charm and elegance. 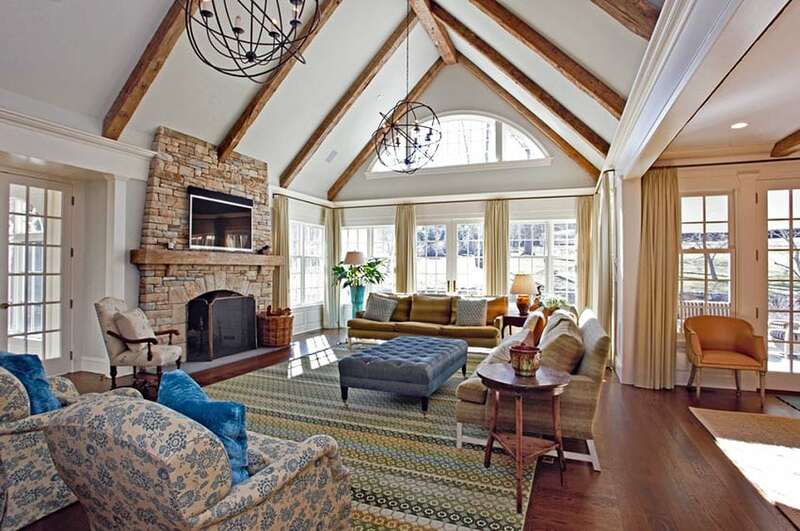 Craftsman living rooms often have high ceilings and wooden exposed beams. This bright craftsman style living room features a stunning vaulted ceiling with exposed beams that support two rustic wrought iron sphere shaped chandeliers. 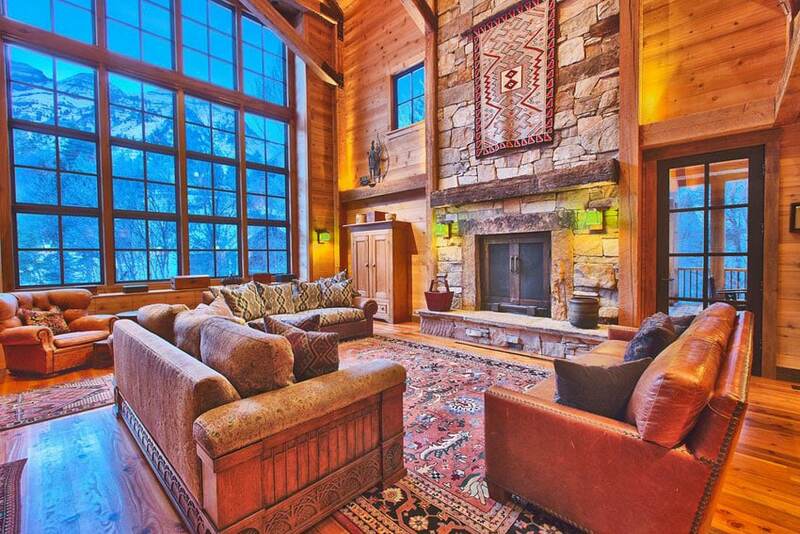 Rich wood flooring flows throughout the space and is complemented by a stone fireplace and multiple french doors. 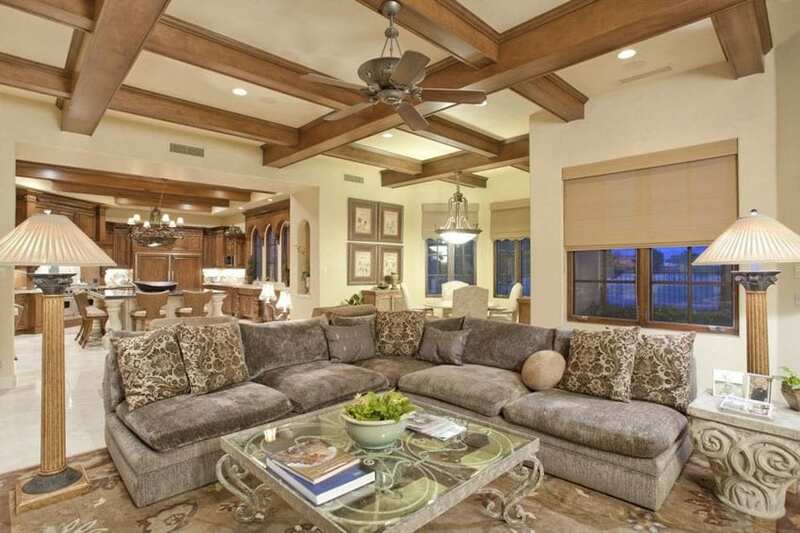 Heavy wooden furniture pieces combined with fully upholstered furniture were used in this Mediterranean style home. The spacious floor are is divided into an open floor space and a compressed living area/entertainment room. This area has a fire placed in the corner with stone mantle, a wooden full entertainment center and orange-upholstered furniture pieces. These pieces stand out well as the walls and floors are simply off-white in color. Adapting an open layout, this living area sits right in the middle of the floor area. Surrounding the central living room is the bar area, the dining area and other sitting areas. 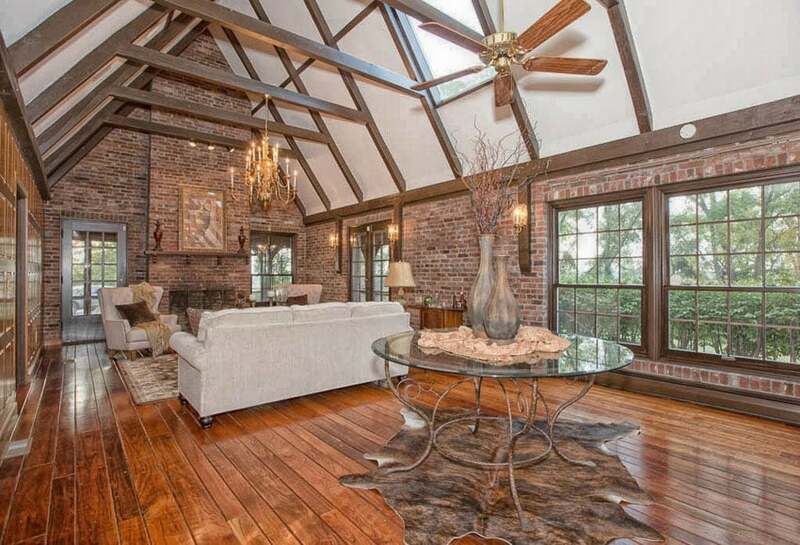 This room is very spacious with a high ceiling and wooden beams & trusses, giving it bit of rustic country look, especially since it also uses 2 large wrought iron chandeliers. Walls are simply painted in a light cream beige color, creating a nice neutral background. For the furniture pieces,this living room use traditional style furniture upholstered in white to make it stand out from the warm background. It also has accents of steel blue and a printed love seat with round blue patterns. The use of blue as accent adds a nice cool touch to the warm-toned interior. This living room design will definitely take you back in time as it looks like it came right out of a classical painting. You will see he heavy usage of wood in this room – dark walnut wall paneling and beams, combined with golden walnut flooring. The luxurious and elegant look is even more emphasized because of the gorgeous crystal chandelier, the heavy traditional style rug and the stone fireplace. The furniture pieces in the room is pretty sparse – 2 armchairs with red tapestry fabric, two side chairs and a piano, but the combination of finishes and patterns is already enough to create this lively and elegant classic interior style. A more modern Mediterranean-inspired living space which has massive folding doors and a high ceiling, making the interior space look really bright and spacious. Walls and ceiling keeps a basic off-white finish, and is paired with solid dark oak wooden floors for a more classic look. For the furniture pieces, you will see a combination of solid Mahogany wooden pieces, as well as canvass-upholstered sofas and armchairs with accent pillows in teal and yellow gold for a fresh, youthful feel. This living room has a more “lived-in” appeal to it, as it looks more casual and less formal than the other examples, adding accessories that also show the personality of the owner. This neo-classic inspired interior has lots of false columns on the walls and the windows, and enjoys a spacious ceiling area to boot. Instead of off-white, this room favors a very light yellow paint for the walls, combined with white moldings and accents. The ceiling, on the other hand, uses white painted wood planks, which helps add a bit of texture to the surface. The layout of the furniture is quite symmetrical – a pair of matching sofas, armchairs and square ottomans were used to complete this look, all of which uses different fabrics for the upholstery. A classic style living room which has a good balance of curves and straight lines, creating a dynamic feel to the simple design. For a fresh and clean look, walls and ceiling area ll in plain white, with white moldings. The doors and windows have teak wood frames which stands out well against the white walls. For the furniture, there’s a simple 2-pieces sofa upholstered in light cream with red-orange accent pillows and a mint green accent chair. In the middle is a large round mahogany coffee table with gilt and fluted sides. There’s also a fireplace in the living area with a very unique mantle design. For the finishing touches, 2 pale gray traditional rugs were used to cover the teak wood floors, while an elegant crystal chandelier hangs on the ceiling. 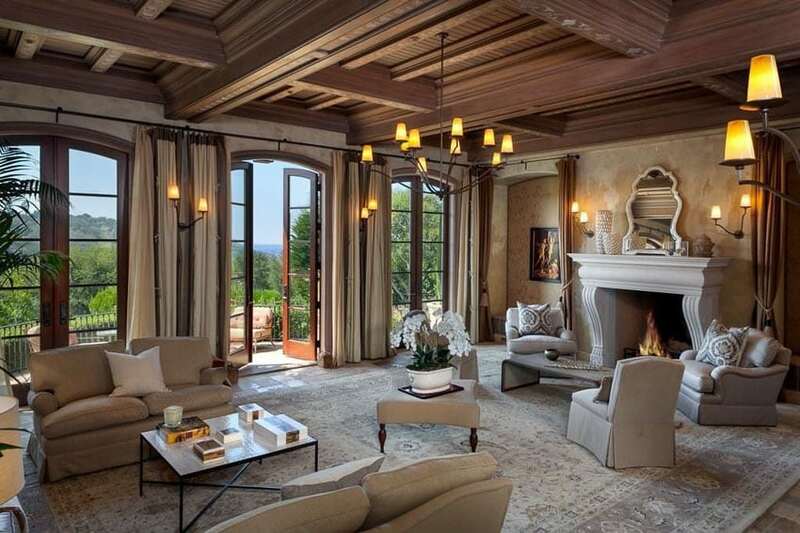 Large open space and a very high ceiling gives this living room a very grand feeling. The basic finishes in the interior details is a combination of warm and cool tones. Cool for the floors as it uses natural stone tiles, and warm for the walls and ceiling, using a combination of off-white walls and oak wood moldings. Hanging from the ceiling are two classic chandeliers to give the room a warm glow. For the furniture, more modern pieces were favored to help balance the heavy details and carvings of the interior architectural details. The furniture pieces are all upholstered in white, with a nice combination of mint green and lilac for the accent pillows and accessories to give it a soft cool tone. When modern and classic elements are combined, it’s typically the interior architectural details which adapts the classic style, but in this example, it’s the other way around. The interior architecture is simple and modern, with straight lines and devoid of unnecessary details. Walls are painted in light beige, and uses golden walnut windows and doors, paired with the same wood for the flooring. The furniture pieces takes a classic English style, but uses a neutral color scheme for the upholstery to match with the modern architecture. All pieces were upholstered in a light beige color with a variety of textures, and uses accent pillows to give a little pop of color. 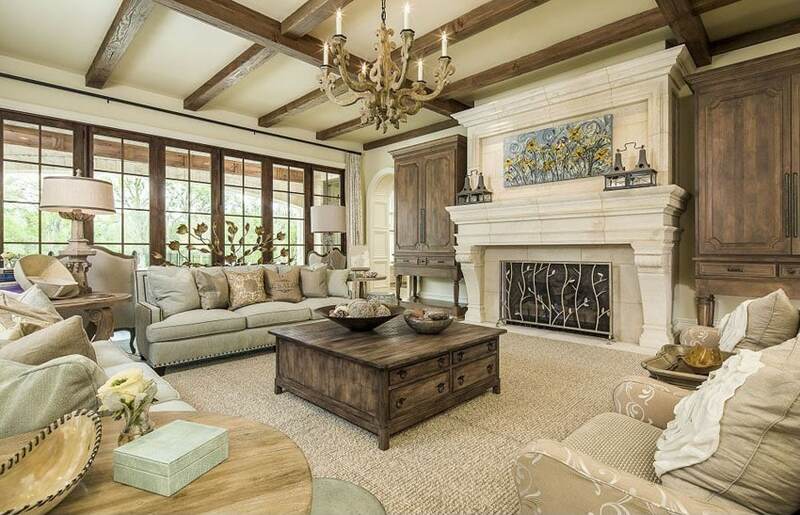 This spacious living area has a relaxed feel to it despite being a little more classic in design style. The ceiling height is standard, with cherrr wood moldings for the coffer ceiling and yellow LED strip light for the cove lights. The walls are white with cherry wood moldings, and the fabric choice for the window drapes is gold. The furniture pieces also follows this fairly warm scheme, using beige upholstery to keep it neutral, and tan leather for the large ottoman. This attic-floor living room has a very dynamic ceiling design as it is composed of various crisscrosses of wooden beams and trusses in solid teak wood. The ceiling itself already commands your attention, so even if the space is only sparsely furnished, it still looks unique and interesting. There’s simple a matching sage green upholstered scroll-arm sofa set, a maple wood coffee table and side tables, and two small storage shelves at the back. 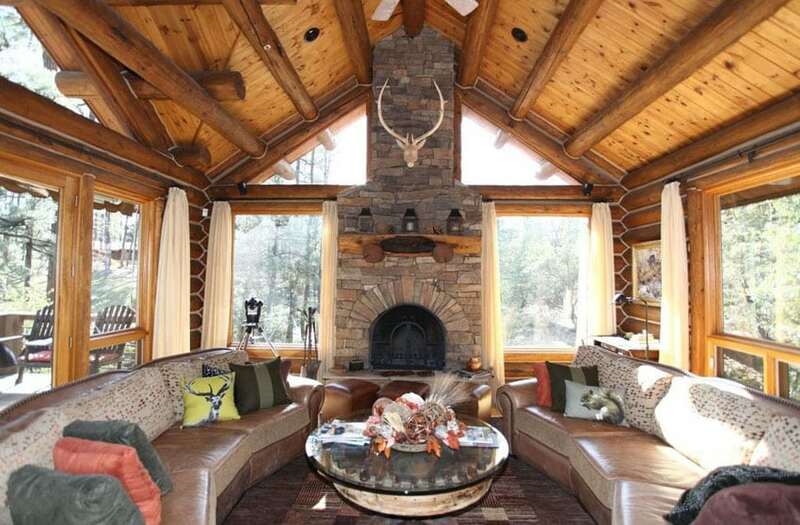 This living room has a modern cabin-style, using solid pine logs for the construction of the space, and combining it with clear glass for a very bright interior. Inside is a small stone fireplace, and two large curved sofas upholstered in brown leather to match the over-all theme of the space. The unique ceiling slopes creates a unique dynamic feel in this living room design. For a more cozy feel, all artificial lights are in warm white, giving it a warm, relaxed atmosphere. 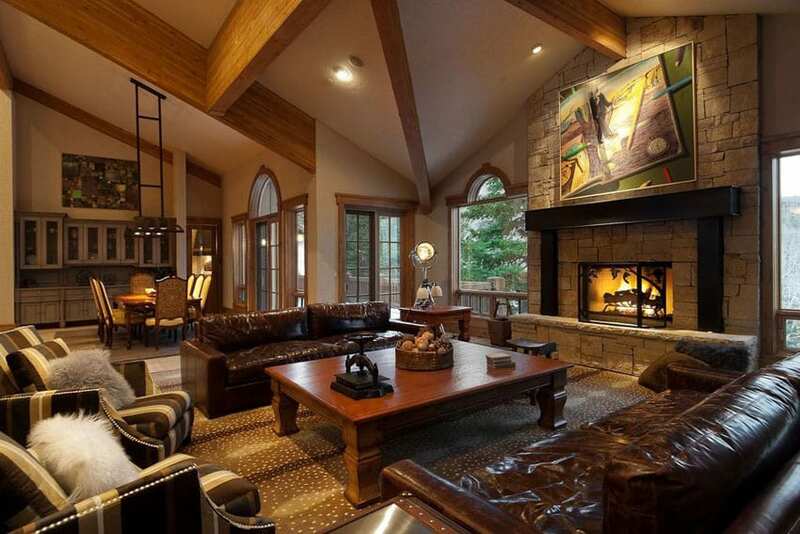 The living area has an open layout making it look more spacious, and uses large and bulky furniture pieces. There are two brown leather sofas and two striped armchairs for the seating, and one large solid teak coffee table with matching side tables. This living room is a more casual lounge area composed of many sitting areas and even a bar area, which is perfect for entertaining guests. The massive space has large sliding doors and windows, giving the room a gorgeous view of the sea, as well as excellent supply of natural lighting during daytime. Walls are oatmeal in color, with matching carpet flooring and solid Teak wood coffer ceiling with an elegant crustal chandelier. The furniture pieces are all classic in style, and uses a variety of fabrics, adding both texture and more personality to the space. The spacious living room in the picture above overflows with classic English vibe, with a bit of rustic appeal as it uses all earth-tone colors. With 3 double doors opening to a patio, the inside looks bright and well-lit despite the fairly dark finish on the walls and the solid wood coffer ceiling. All furniture pieces have matching plain beige upholstery, making the entire living area look cohesive. Rustic colors and finishes combined with antique furniture definitely give off an authentic classic vibe to this living room design. Walls are painted in cream to match with the sandstone floor tiles, while doors and windows uses dark oak wood frames. 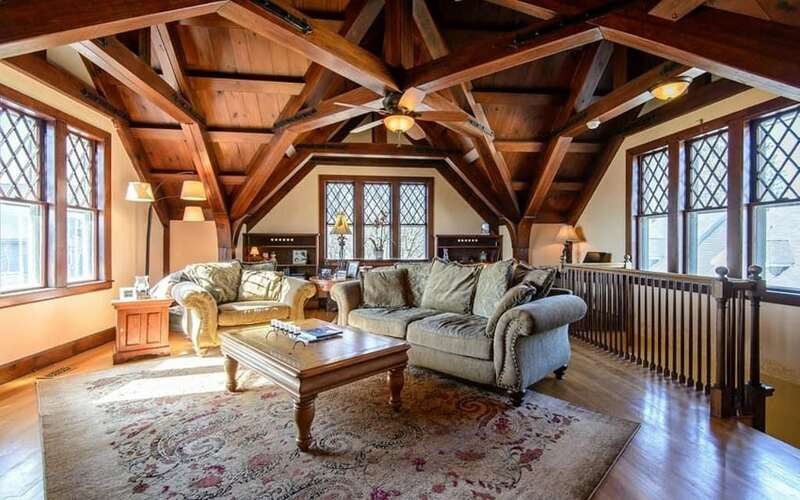 On the high ceiling, you will see ornamental wooden trusses with a unique design, making the ceiling an interesting architectural detail. 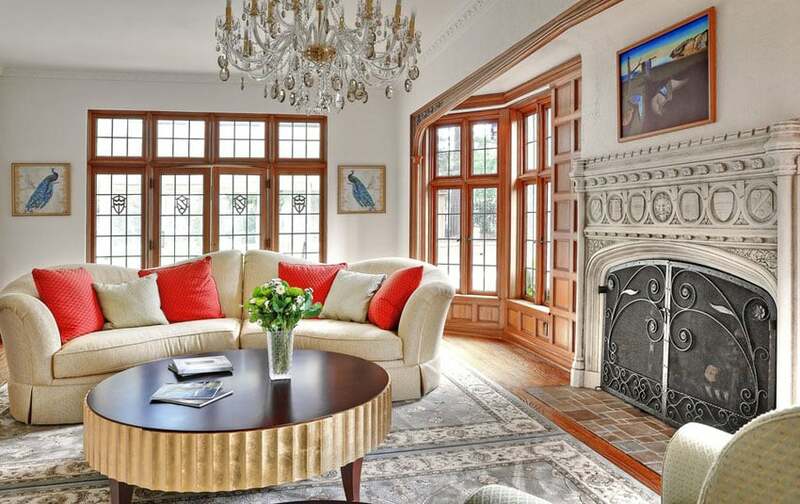 There is also a large stone fireplace inside, with two built-in display cabinets/shelves on each side for balance, and massive furniture pieces upholstered in warm colors to keep with the colors scheme. The interior architectural details of this living room design is a combination of modern simplicity and small classic details to give it more dimension. 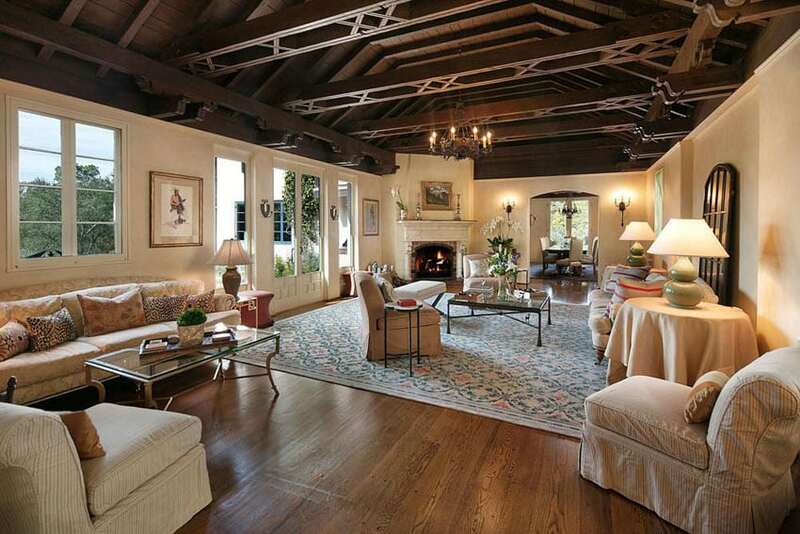 Off-white walls and ceiling were paired with mahogany doors and windows, as well as ceiling coffer. Furnishings takes a more classic design style, using gray velvet l-shaped sofa, paired with white wrought iron coffee table and a unique column capital for a side table and classical order-inspired floor lamps. 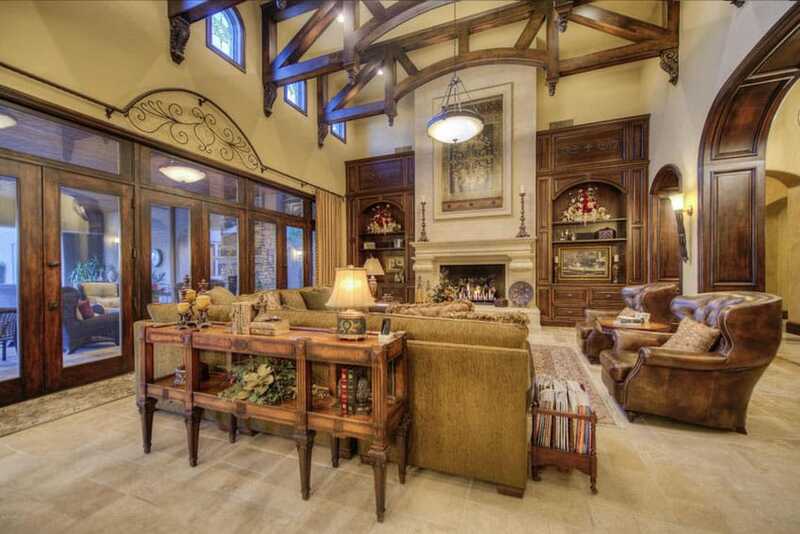 Craftsman living rooms are known for the warmth of their natural wood finishes. The snow-capped mountain background gives a cool tone to the environment, so to counter this, the whole interior of this living room goes of a bold red and orange color scheme, giving it a really warm feel. Walls uses solid pine boards for cladding, combined with solid teak wooden supports. 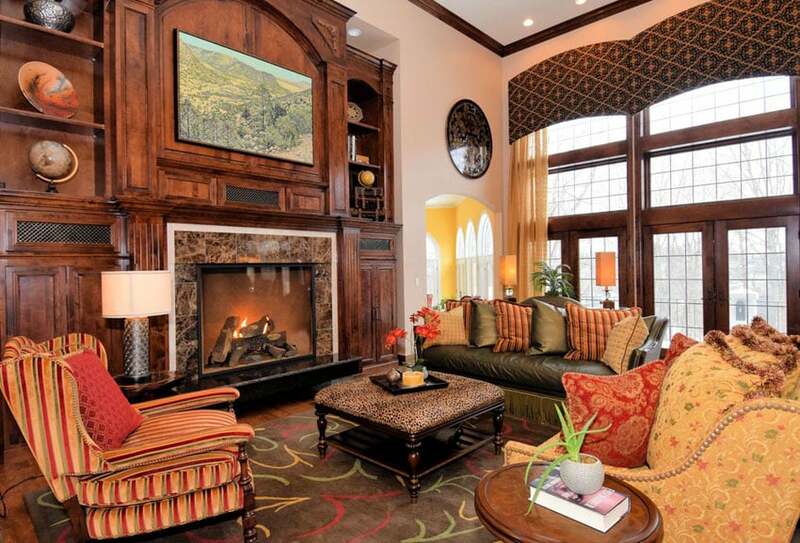 The fireplace uses warm-toned masonry stones for its finish, and all furniture pieces, including the area rugs and accent pillows are upholstered in warm colors as well. Lights used are also warm, giving the space a warm and cozy glow, despite the cool background seen outside the large windows.